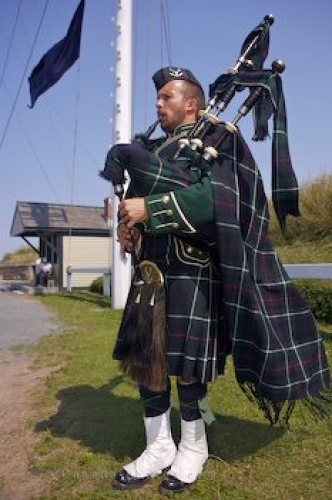 A Scottish bagpiper clad in his full uniform lets his music be heard throughout the Halifax National Historic Site in Nova Scotia, Canada while standing near a flag pole. The sounds which a bagpiper can create from a set of bagpipes is amazing and many people can listen to the Scottish tunes for hours at a time. This bagpiper is a member of the 78th Highland Regiment and they perform for tourists to the Halifax Citadel during the summer months. Picture of a bagpiper in uniform at the Halifax Citadel National Historic Site in Nova Scotia.